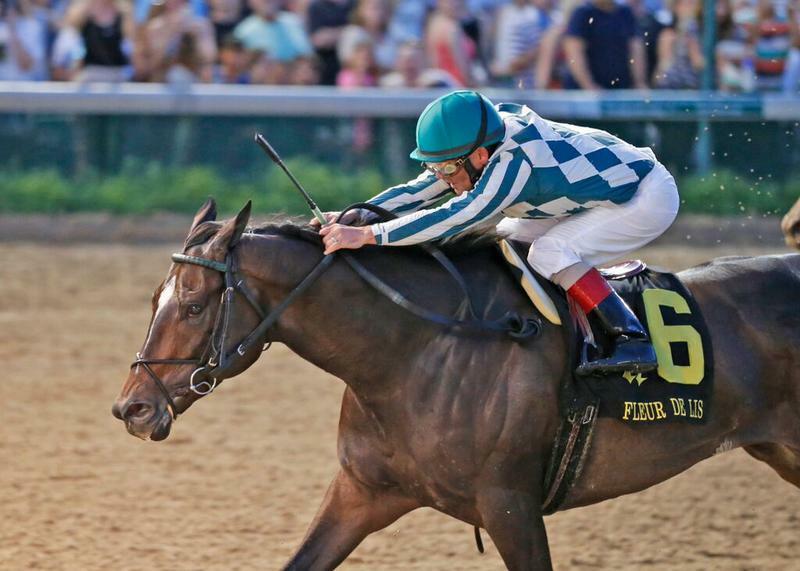 Next Saturday’s 25th running of the $200,000 Mrs. Revere (Grade II) at 1 1/16 miles over Churchill Downs’ Matt Winn Turf Course is likely to attract a full field of 3-year-old fillies, according to the track’s assistant racing secretary and stakes coordinator Dan Bork. On Saturday morning, Bork had a list of 15 possible starters with the field limited to 14 starters. Preference is given to graded stakes winners then highest career earnings. 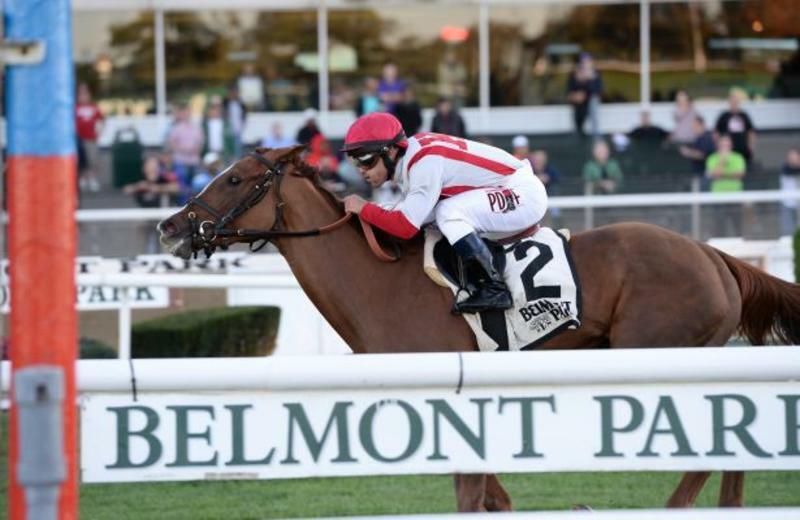 The known possible starters:: 2014 Jessamine (GIII) champ Rainha Da Bateria ($193,536, trained by Graham Motion); Regret (GIII) winner Prado’s Sweet Ride ($153,730, Chris Block); Lady Fog Horn, a winner of four straight Indiana-bred stakes races ($386,806, Anthony Granitz); Partisan Politics, a 1 ½-length winner of the $200,000 Pebbles at Belmont Park ($248,300, Chad Brown); Return to Grace, winner of the $199,429 Dueling Grounds Oaks and Pucker Up (GIII) runner-up ($204,760, Mark Casse); Celestine, a winner of three consecutive stakes ($201,075, Bill Mott); stakes-winner and graded stakes-placed Isabella Sings ($191,110, Todd Pletcher); Parx allowance winner My Cara Mia ($148,517, Mitchell Freidman); Grade III-placed Kathballu ($141,164, Kenny McPeek); Belmont and Keeneland allowance winner Robillard ($120,360, Kiaran McLaughlin); Belmont allowance winner and Grade III-placed Tammy the Torpedo ($116,000, Chad Brown); stakes-placed Darling Sky ($105,329, Robert Reid Jr.); three-time winner Urtheoneeyelove ($76,532, Eric Reed); Athenia (GIII) runner-up Wiener Valkyrie-GB ($66,968, Ed Walker); and maiden winner Nancy Ride ($38,200, Brendan Walsh). Canadian-bred Secret Action ($146,708, Michael Doyle) also was under Regret consideration but is entered in Saturday’s $150,000 Jammed Lovely, a restricted seven-furlong sprint for 3-year-old fillies over the synthetic Polytrack surface at Woodbine. The Mrs. Revere, won last year by Sparkling Review, is North America’s last graded stakes race of the year for 3-year-old fillies on turf. 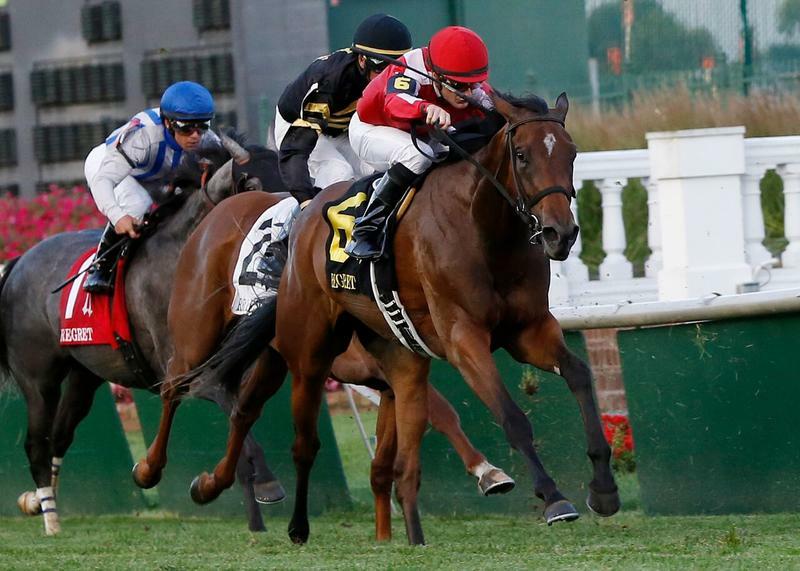 RETURN TO GRACE PUTS IN FINAL MRS. REVERE WORK – Calumet Farm’s stakes-winning homebred Return to Grace finished her serious preparation for next Saturday’s $200,000 Mrs. Revere (GII) with a half-mile breeze in :47.60 on Saturday morning at Churchill Downs. Return to Grace, a daughter of English Channel, enters the Mrs. Revere off a fifth-place finish in the $500,000 Queen Elizabeth II (GI) on Oct. 10 at Keeneland. 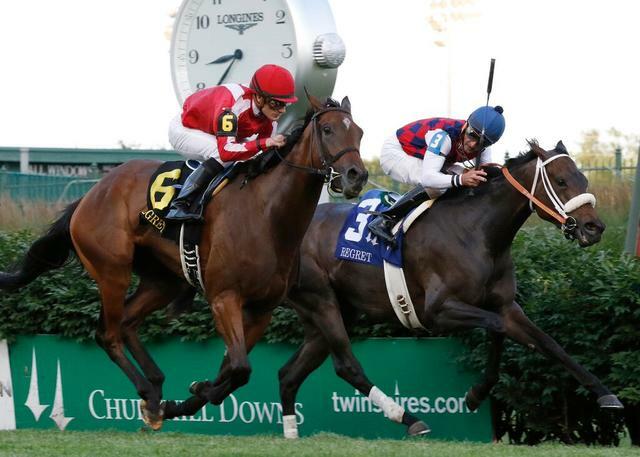 She has won or placed in three stakes races this year, including a victory in the $199,429 Dueling Grounds Oaks at Kentucky Downs on Sept. 19. In other Mrs. Revere news, Five D Thoroughbreds’ Kathballu breezed five furlongs in 1:04.20 on Saturday at Churchill Downs for trainer Kenny McPeek. Trainer Brendan Walsh put Chad Schumer’s Nancy Ride through a four-furlong breeze in 49 at the nearby Trackside training center. In New York, Siena Farm LLC’s Isabella Sings breezed a half-mile over the Belmont Park training track in :50.40 for trainer Todd Pletcher. FRIVOLOUS MAY CHALLENGE MALES IN GRADE I CLARK – G. Watts Humphrey’s Frivolous, the three-time Churchill Downs stakes winner who was fifth in the Breeders’ Cup Distaff (GI), is under consideration to face males in the 141st running of the $500,000 Clark Handicap Presented by Norton Healthcare (GI) on Friday Nov. 27, which would be the final start of her career according to trainer Vicki Oliver. The 5-year-old daughter of Empire Maker, a winner of five races and $750,718 in 24 starts, has a record 7-3-0-2 at Churchill Downs. She won last year’s Falls City Handicap (GII) at odds of 19-1, this summer’s Fleur de Lis Handicap (GII) at 32-1 and the Locust Grove in September as the 6-5 favorite. RICHARD OFF TO GOOD BEGINNING AT FALL MEET – It has been an excellent beginning of the Fall Meet for trainer Chris Richard, who entered Saturday with atop the Churchill Downs trainer standings with four wins in seven starts. One horse in particular that Richard spoke highly of was 2-year-old Unexplained, a winner on the Stars of Tomorrow I card that he will point toward a start in a first-level allowance race at one mile on Nov. 28. “We’ll see how he handles winners and then take it from there,” Richard said. AMOSS GETS TWO BAGGER ON FRIDAY –Trainer Tom Amoss enjoyed a successful Friday taking the seventh and ninth races with the Tanner’s Popsicle ($5.80) and Hazards of Love ($4), who are owned by Maggi Moss and were ridden by Corey Lanerie. Tanner’s Popsicle made his fourth straight trip to the winner’s circle in eight starts this year, in which he has never finished worse than second. Last November, Amoss claimed the son of Wildcat Heir from trainer Bret Calhoun for $30,000. Hazards of Love won his 25th race in 71 career starts which pushed the 8-year-old gelding’s earnings to $535,208. Like Tanner’s Popsicle, Amoss acquired Hazards of Love through the claim box. He was claimed by the trainer in March 2013 for $10,000 at Delta Downs from trainer Brent Kennedy. Since then, he has made 28 starts and has only finished off the board twice. DOLLASE MEMORIAL SERVICE ON SUNDAY – A memorial service for trainer Wally Dollase will be held Sunday at Southeast Christian Church at 920 Blankenbaker Parkway in Louisville. Dollase passed away on Oct. 30 after a lengthy illness at age 78. A visitation will take place at the church at 1:30 p.m. and the memorial service will follow at 3 p.m. Dollase trained champions Itsallgreektome and Jewel Princess and won 80 graded stakes races. He relocated his stable from Southern California to Kentucky in 2005 and won 24 races at Churchill Downs through the 2011 Spring Meet during that span. FAMILY ADVENTURE DAY HIGHLIGHTS SUNDAY’S ON-TRACK EVENTS – Presented by Kroger and in partnership with Kosair Children’s Hospital, Family Adventure Day will be held Sunday (Nov. 8). While adults enjoy the racing action, the kiddos will relish numerous activities throughout the day. Tickets for adults and children age 3 and up are $8 in advance online at ChurchillDowns.com or $10 at the gate. One dollar of every event ticket will benefit Kosair Children’s Hospital. Family Adventure Day tickets include admission and access to the Courtyard (Section 119) for trackside viewing plus a wristband to access for all activities beneath the Grandstand Terrace.